The release in France of a new collection of his poems (“Notes of a blissful ghost”, ed. Caracteres) encouraged us to continue reading his works with the comments of Caroline Morlat , a young poet who has great admiration for him. Cultural Revolution and ” misty poets” After the end of the Cultural Revolution and the death of Mao Zedong (1976), the political debate begins to take shape and handwritten posters are pasted, as from late 1978, on the Beijing Democracy Wall, where improvised meetings are held. Poems also; the magazine “Jintian” created by the poet Bei Dao is page per page glued on the walls of Beijing and will be banned two years later. 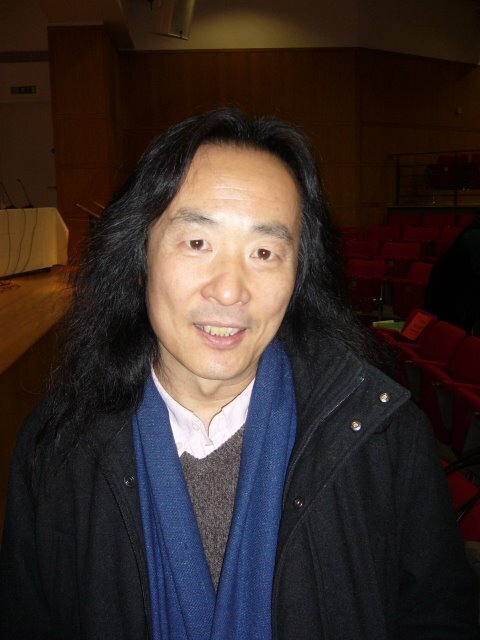 Yang Lian is involved in this movement; he was born in 1955, his father, an English teacher, gave him a classical education in which poetry is an important factor. Sent “to the countryside ” in 1974, he stayed for three years in a small village north of Beijing, where nothing had changed for centuries. He returned to Beijing a few months after the death of his mother, an essential drama. “Misty”poets refuse the tradition of revolutionary realism and poetry in the service of politics. Poetry is an individual creation, it is a mirror of one self. It can lead to social critique but also to romantic images. Surrealism is present, but mostly for Yang Lian a rediscovery of Chinese culture. The poet is not a teacher for the people, “I”is more important than “us”. Authorities criticize this hermetic poetry which is considered too westernized. A debate is introduced on modernity in art and the responsibilities of poetry. Two poems by Yang Lian: Norlang (the god of a waterfall in the Tibetan part of Sichuan) and Banpo (named after an archaeological site) are strongly criticized. Search for one’s roots, epic poetry, shamanic tradition of the poet, all these themes were developed after numerous trips by Yang Lian along the borders of China and among the “non Han” people. He is in New Zealand with his wife, Yo Yo, a writer and painter, during the Tiananmen Square massacre in 1989. Exile begins, he is hardly prepared and does not speak English. He will first complete one of his major works “Yi” (“The Sun of a Man “) before writing essays and short poems for several years. He published “Where the Sea stands still” , inspired by the cliffs of Sydney. Four collections of poems have been translated as from 2001 by Chantal Chen Andro of the University of Paris VII (also a translator of many texts by Bei Dao and Mo Yan) and published by Editions Caracteres [. “Notes of a blissful Ghost” In why it can be only prose, Yang Lian radiates a major part of his creation by identifying the end,the emptiness, death of course, the imaginary associations blessed with a sky which reflects the fire of senses and dementia as footsteps meeting each other, establishing, unbounded, a delightful journey, sometimes arrogant, often dark. This extract of the notes of a blissful ghost does not turn the pages, you would rather like that heaven provides it but it gives a breath irradiating the entire book. Beauty bounces with reverse feelings and rowdy slopes: “Whoever looks at the sea is more extreme than the cliff.” All snaps, everything takes, subjugates all in this translation of “love typography” which folds the speech while giving birth in reverse when “the world is a fuzzy translation. Love is the first impulse that pushes you to this work, so delicate with colored eyes to movements heckling, challenging loudly nature in its broadest sense: images, associations and qualifiers are sublime, and more that they represent beautiful moods. Finally come the words as “language becomes the sole object of poetic” and with them the poet. Extreme beauty, extreme violence, extreme silence that reading a language which the author is probably the evidence that real poetry stil exists. This is one of the definitions given by Yang Lian about writing a poem. We could try to add: shelter to conquer the challenge of the boiling edges of this huge land, often underwater, creating the language. His work has enjoyed multiple influences by Western poets some of whom he has translated into Chinese (T S Eliot, WB Yeats …) but especially the American Ezra Pound. Chinese tradition is essential, whether the great poet Qu Yuan (-343/-279 BC.) or the shamanic tradition. The themes of exile and language are discussed in a little book of conversations between Yang Lian and Gao Xingjian. With exile, the constraints disappear and in particular the role of criticism towards the society where the poet comes from. Is the language a tool or an objective in itself; what are the characteristics of the Chinese language, what is the writer’s responsibility towards his language? Seeing nothing but ready to watch, the poet in exile creates and deletes these issues and must constantly convince himself that exile is not a profession. The wild geese are the symbol of wandering and sorrow, but Lee Valley (title of his latest book) where he lives in the north of London has its charm because he does not feel a foreigner after years in the south Pacific, the United States and Germany. Only when we can bring different local experiences then the international experience is strong enough. After being banned, his books are published in China, where he returns as from 1997 in order to meet his father. He is not an active dissident even if his positions as director of PEN are very clear. A certain resignation is perhaps now part of this generation of the “misty” poets “. China has changed so much, the young generation is shaped by American popular culture, what is now the meaning of language and tradition?